Alcohol use is highest among young adults. According to the National Epidemiologic Survey on Alcohol and Related Conditions (National Institute on Alcohol Abuse & Alcoholism, 2005), 70% of young adults in the United States consumed alcohol in the previous year. Research shows that young adults not only drink more often but are more prone to binge drinking and heavy drinking (see Figure 7-1). Binge drinking is defined as drinking many drinks in a row at least one time during a month. Heavy drinking is defined as drinking five or more drinks in a row at least five times in one month. Drinking is detrimental to health and leads to alcohol-related traffic fatalities. In 2003, 32% of young drivers involved in fatal traffic accidents had measurable alcohol in their blood. Fifty-one percent of drivers aged 21–24 who died tested positive for alcohol (U.S. Department of Health & Human Services, Substance Abuse & Mental Health Services Administration, 2008). The amount of one drink is different for each type of alcoholic beverage. All of the following are one-drink equivalents. Note that one drink can contain multiple servings. For example, a 40 oz bottle of beer contains 3.3 drinks, and mixing liquor to make one cocktail can add up to more than one drink (National Institute on Alcohol Abuse & Alcoholism, 2005). Why Is Binge Drinking a Problem? Binge drinking may appear harmless but the consequences are very serious. Binge drinking is defined as drinking five drinks in a row for males or four drinks for females. Binge drinkers are eight times more likely to miss class or get behind in schoolwork. Binge drinking can lead to “blackouts” or not remembering what happened during drinking. Binge drinkers are also much more likely to drink and drive. Isn’t Drinking Alcohol Just Part of the College Experience? Research shows that drinking alcohol is prevalent for persons in their twenties, regardless of student status. Yet surprisingly, persons in their twenties who attend college tend to drink less often overall and in less quantity. Students who finish college are less likely to continue drinking past early college years. Rates of alcohol dependence are lower in 18–24 year olds who attend college (U.S. Department of Health & Human Services, Substance Abuse & Mental Health Services Administration, 2008). So, to answer the question above, just because you are in college does not mean you need to feel pressured or obligated to drink. A useful short assessment to determine if you think you should talk to someone about your drinking is the “CAGE” questionnaire (Ewing, 1984). Have you ever had a drink first thing in the morning (an eye opener) to steady your nerves or get rid of a hangover? Answering with even one “yes” answer suggests a possible problem with alcohol. More than one “yes” answer means that it is highly likely that a problem with alcohol exists. The effects depend on how much someone drinks and for how long. Short-term effects of alcohol that occur after only one to two drinks are difficulty walking, blurred vision, slurred speech, slowed reaction times, and impaired memory. These effects resolve after drinking stops. Misuse of alcohol affects every part of your body, including your kidneys, liver, central nervous system, and brain. Long-term effects of persistent drinking include impaired kidney function, cirrhosis of the liver, nervous disorders, and brain damage (National Institute on Alcohol Abuse & Alcoholism, 2005). A study by the Harvard School of Public Health (Wechsler & Nelson, 2008) found that negative effects of alcohol occur even at small levels. Alcohol can reduce cognitive and psychomotor performance which can lead to negative health consequences. The number of drinks consumed at one time significantly increases your risk of alcohol-related injury, such as falls and motor vehicle accidents. Can Drinking Affect My Schoolwork? Wechsler and Nelson (2008) from the Harvard School of Public Health concluded that drinking alcohol, either routinely or binge drinking, can negatively affect school performance. Academic performance is affected by skipping classes, risk-taking behaviors such as academic dishonesty, ignoring deadlines, and spending fewer hours studying resulting from drinking. Alcohol consumption can also affect social relationships, including relationships with peers and faculty. In 2005, The Texas Department of State Health Services conducted a survey of substance abuse among college students (Liu, 2007). Although drug use was found to be lower than alcohol use, many college students use drugs such as marijuana, cocaine, stimulants, sedatives, and others (see Figure 7-2). In 2005 (Liu, 2007), 23% of all students used an illicit drug within the previous year. 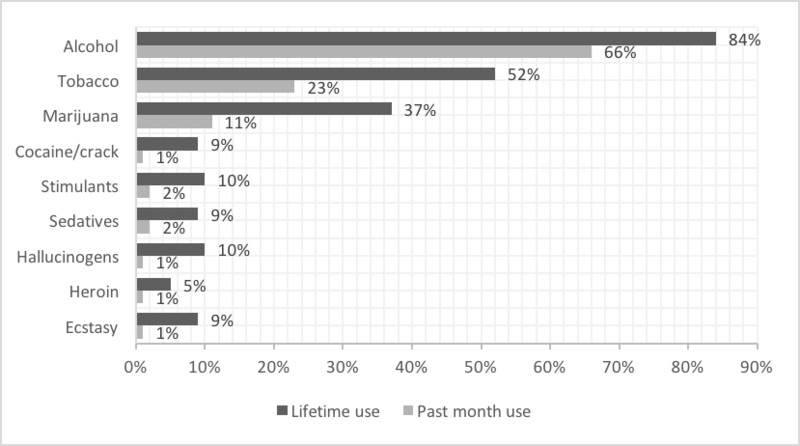 Thirteen percent used within the previous month. Male students were much more likely than female students to abuse drugs. 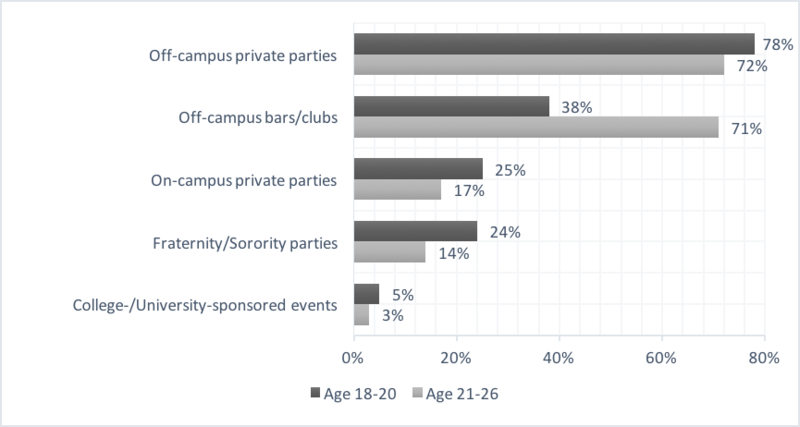 Drug use increased among students who were members of a fraternity or sorority, and drinking alcohol was more common with students who used drugs. From the National Institute on Drug Abuse, National Institute of Health (2010). How can using drugs impact your ability to learn in college? Marijuana is the most popular illicit drug. About 37% of college students reported experience with marijuana. Males were twice as likely to use marijuana as females. Many students (61%) believe marijuana to be harmless (Liu, 2007), but it can cause depression, anxiety, and personality disturbances. Marijuana limits the ability of the user to learn and remember information, and it can also affect social skills and daily life functioning (National Institute on Drug Abuse, 2010). Research has shown that marijuana’s effects on memory and learning lasts many days or weeks after the effects of the drug wears off (Block & Ghonheim, 1993). Students who smoke marijuana, even occasionally, get lower grades and have difficulty with registering, organizing, and using information (National Institute on Drug Abuse, 2010). We have long known that tobacco (cigarettes and chewing tobacco) is detrimental to your health. 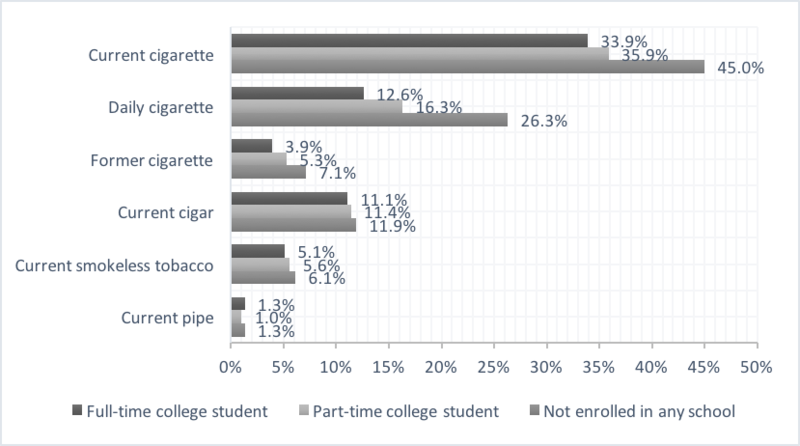 Still, tobacco use is common among college students. Studies show that college students use tobacco when stressed or when friends use tobacco (U.S. Department of Health & Human Services, Substance Abuse & Mental Health Services Administration, 2008). Nationally, 27% of persons aged 12 and older used tobacco in 2002–2003 (Office of Applied Studies, 2008). Tobacco contains nicotine, an addictive substance, and addiction can occur after smoking as few as 100 cigarettes (National Institute on Drug Abuse, 2009). Tobacco can affect your health on a long-term basis. Smoking is the leading cause of lung cancer, and it can also affect your mouth, throat, bladder, pancreas, and kidneys. Cigarette smoking accounts for 44,000 U.S. deaths each year (National Institute on Drug Abuse, 2009). Similar to drinking, some college students develop smoking habits in college thinking it is part of the college experience. Given the long-term health ramifications and addictive nature of smoking, think twice about starting a habit with such consequences.